Wolf with all his manifestations is to be looked as an ancestor of all house dogs. Besides, it is barely conceivable that the small chihuahua and the mighty mastiff have the same clock forefather. If we remember, nevertheless what has originated only during the last approx. 100 years in variety under the dogs in the race dog breeding, there falls to us the image of the big and small dogs which should come everything from Wolf as a forefather lighter. Today one assumes from the fact that person and dog live together for approx. 15000 years. 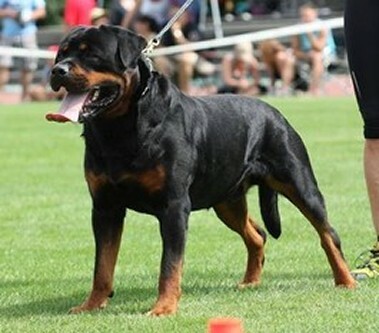 About the origin of the Rottweilers the most different views exist. 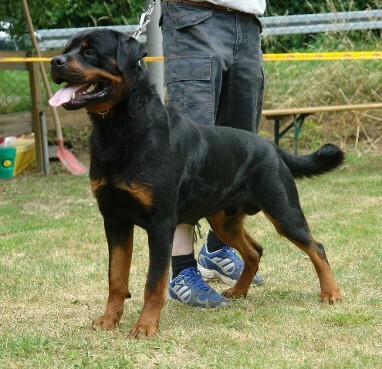 In view of the fact that the special suitability of the Rottweilers existed in the activity of cattle and obviously this activity was primarily explained in the last time, the forefathers our Rottweiler are to be found in the Roman legions at that time. The Romans used dogs as herds and cattledogs. These dogs protected the people and the cattle. Still today one can the course of the old Roman army streets from what one of these streets led over the Alps in the direction of Lake of Constance, because the road system of the Roman world empire is investigated very thoroughly. Now, one reached in the area of the today's town Rottweil, the town which gave the name to our dog. In the other course of the 19-th century the Roman dogs with down-to-earth shepherd's dogs of different kinds were paired. In the course of several decades these dogs on ability to survive, intelligence, perseverance and Treibeigenschaften were bred. They became therefore indispensable assistants of the cattle dealers and butchers. 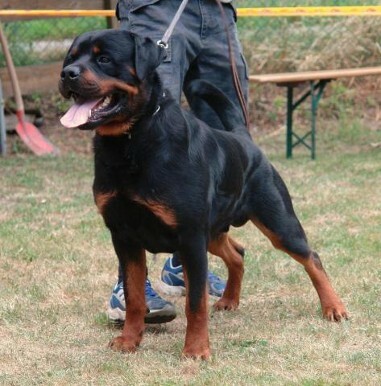 As already mentioned, this dog was spread most often in and around the imperial town Rottweil at that time and thus he received in the Middle Ages the name Rottweiler. If the dogs stood in Rottweil in so high esteem, this probably had before all his reason in the fact that they often proved themselves as hats and cattledogs. Rottweil was in the 19-th century a distinct cattle trade-center, from where cattle and sheep above all in the mash region, in Alsace and in the Neckar Valley were done. With such stove trains one needed at times where there was robber or wolves and wide regions were barely settled, strong, persevering, quiet and clever dogs. 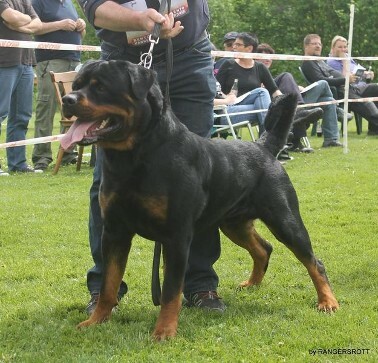 A right butcher from Rottweil and surroundings normally had immediately several Rottweiler, because in the hands of the butchers cattle trade lay primarily. Now, in the course of the time the cattle were transported by amount of the railroad and other vehicles in other kind and the Rottweiler of his so useful task at that time were ridded itself. 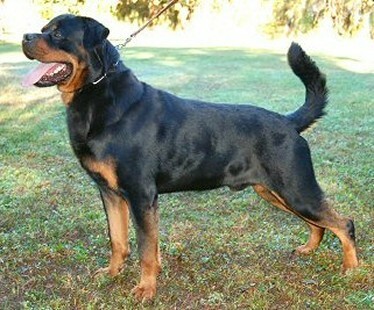 Only at the beginning of the 20-th century one remembered the excellent traits of the Rottweilers. The high value in use of this race was tested in the police service, and in 1910 the Rottweiler was recognized as a police dogs race. At that time as today the person is fascinated by this dog race. His loyalty as well as diligence, Führigkeit and calmness prove the value in use of this dog race. 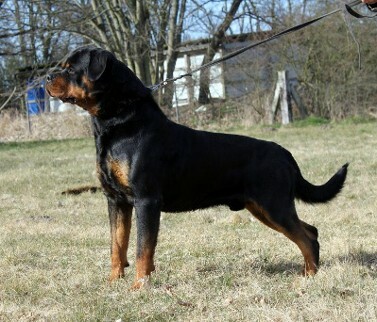 Also as a family dog the Rottweiler is a dependable and loyal friend with expert breeding and breeding as well as Sozialisierung within the family. As with the person the education and Sozialisierung also begins with the dog with the child or puppies. Of every Rottweiler at the puppy's age is ready to learn, to submit one and, to adapt itself to his herd. He is stamped often by his environment. A right education leads to friendship. 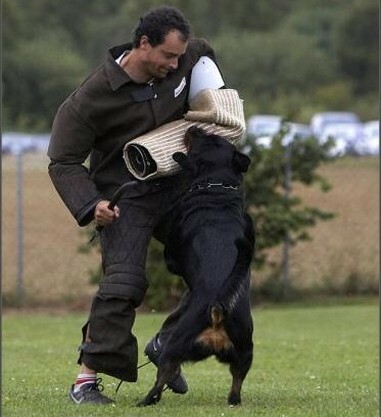 Wrong, loveless training will spoil the dog and therefore the living together between person and dog for good. 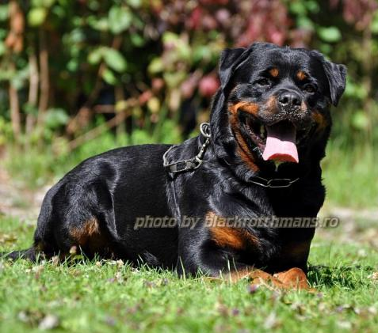 The person is responsible, primarily, for what becomes from our Rottweiler! This concerns breeding, education, health and living together! 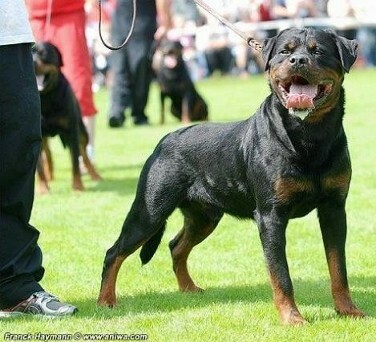 For the general German Rottweiler club e. V. as a sole breeding federation approved for the Rottweiler in the federation for the German dog being, make clear more than 90-year breeding supervision to receive competence and obligation at the same time, this German dog race and cultural asset Rottweiler and to improve. By the most austere breeding choice which we adapt over and over again to the new challenges and environmental factors the ADRK e tries. 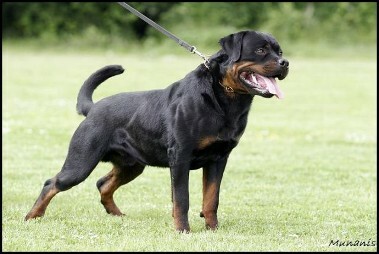 V. to improve the quality of our Rottweilers further. The uppermost purpose of our breeding must be the health of our dog. Expression of the health are the psychic and physical loading capacity of our dogs. The breeding purpose calls more than ever " the healthy and in the behavior self-confident and friendly use dog and family dog, linked by the best form and achievement ". 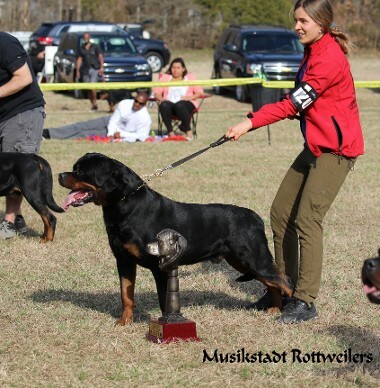 Any time the Rottweiler has fascinated the people, I hope other friends that the Rottweiler wins and the existing lovers of our race are anew inspired. Cheers our dog as well as the Rottweiler family all over the world.